We were 1-1-1 last week, with the Buffalo Bills (+4) pushing after missing a wide-open, go-ahead touchdown in Miami, a winner emerging in New England (-4.5) and a complete second-half collapse by Pittsburgh (-3) keeping us from an undefeated week. We’re on to Week 14, with a more-exciting slate of games. We’re picking four, including our first over/under in some time. With the Pittsburgh loss and the Texans win total going over, we’re 19-16-1 on our “Lock of the Week” picks since the start of 2017 (54.3%), with three win totals pending. The analyses below will involve a point-counterpoint between the two of us for all five picks, using perspectives that only the PFF grades and data can provide. Follow us on Twitter at @PFF_Eric and @PFF_George, and for some podcast commentary on some of these picks, and the process that goes into them, give the PFF Forecast a listen. 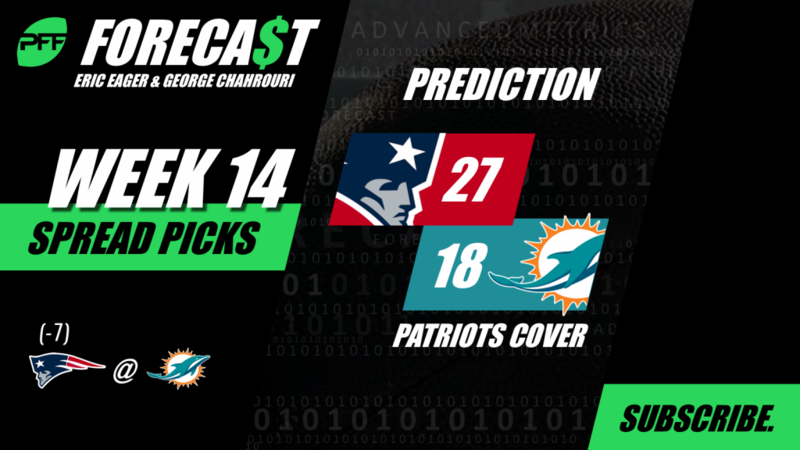 Point (George Chahrouri): In the eyes of many, Ryan Tannehill is having a good season; his passer rating is just a half-point shy of Andrew Luck and nearly two points above Tom Brady. However, Tannehill’s box score stats are about as real as the average pair of lips in Miami beach. So far this season, he’s made two and a half times more turnover-worthy plays than big-time throws. After the New England offense held the Minnesota Vikings‘ savior Kirk Cousins to a stupefying 4.6 yards per attempt from a clean pocket, the 10th-worst mark for a quarterback with 20-plus clean dropbacks (the NFL average is 7.9), we would figure that Tannehill and crew should not pose much of a threat. While Brady isn’t having his best season, it is significantly better than public perception. When everyone is talking about how the Patriots struggle in a given situation, that is precisely when I want to be on the side of pliability. Point (EE): This was our pick of the week in Week 4, and after what was one of the more analytically-sound (but gut-wrenching) decisions, the Colts opted to go for it in overtime instead of punt and the team lost a three-point game in overtime at home. While the Texans have taken that win and won every game since, they are something of a paper champion as opposed to a true standout in the AFC South, allowing early-down EPAs and success rates on defense, while Andrew Luck has been more accurate and has generated more big-time throws than Deshaun Watson. With Watson and DeAndre Hopkins dealing with injuries that have them questionable for this affair, look for the Colts to make enough plays to keep this game close enough to cover the number and flirt with a win that would take them over their season win total of 6.5 games going into the season. Counterpoint (GC): Outside of the truly elite quarterbacks, I’m not sure there is anyone who terrifies me more when he has the ball than Watson. He and Hopkins have combined for 31 gains of 15-plus yards (2nd) and not a single drop in their 112-targets (T-1st). The Colts’ cornerbacks are allowing a passer rating of 107.3 into their coverage (ninth-worst) and their defense as a whole ranks 26th, so the Colts will have to score points to keep up. With T.Y. Hilton still nursing a shoulder injury, their spirit may be willing, but the bodies are a little week. Point (GC): Fat Pat at home against a Ravens defense without their best cover corner a week after Tyreek Hill had a season-low one catch? Give it to me. 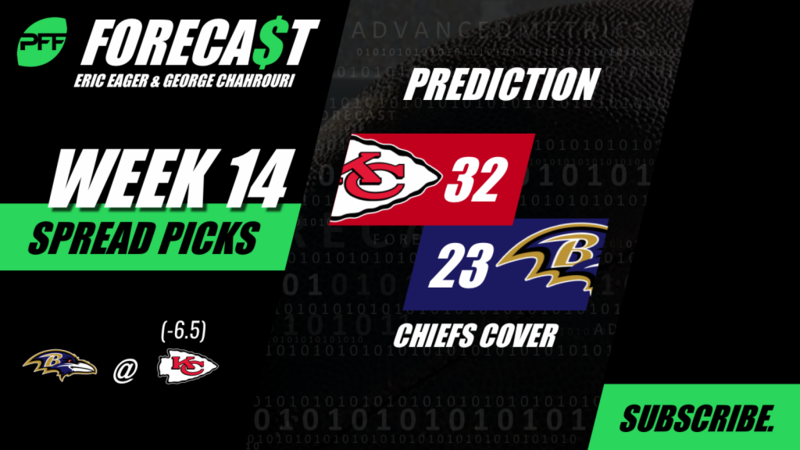 At less than a touchdown favorite at home, this line says the Chiefs are a mere 3.5 points better than the Ravens on a neutral field. This is madness. The Ravens’ three-game win streak isn’t exactly impressive, with a narrow win against the Bengals, the Raiders and the Falcons. Mahomes has a 140.5 passer rating from a clean pocket this year – which is the best mark since 2006 – and his 36 completions on throws 20-plus yards downfield is nine more than any other quarterback this season. The Chiefs have no trouble putting up 35, especially with the moral and physical upgrade at running back. Meanwhile, the Ravens aren’t built to score a ton thanks to Lamar Jackson’s still-developing passing attack that has yielded a catchable pass on a league-low 70.5% of his throws since he took over for future Jacksonville Jaguar Joe Flacco. Counterpoint (EE): The Chiefs have been terrible this season at the inside linebacker position. Free-agent acquisition Anthony Hitchens (39.8), 2017 trade acquisition Reggie Ragland (53.1) and 2018 draft pick Dorian O’Daniel (52.1) have all had their crack against running backs both in the passing game and the running game, and have struggled mightily. This weakness matches up with the strength of the Ravens in a big way, where quarterback Lamar Jackson is averaging 6.9 yards on designed runs to the left, 7.0 yards on designed runs to the right, while running back Gus Edwards has averaged five yards per rush on all of his carries since he took over for Alex Collins. While rushing does not matter very much in general, matchups do matter in the NFL, and if the Ravens happen to get ahead early in this game, it might be difficult for the Chiefs to get enough stops to win their sixth home game by seven or more in as many tries. Point (EE): For the first time in a while, we have a win total! This one is a bit counterintuitive but bear with us. In this game, you get to see the most efficient passing offense in the AFC in the Chargers, with 57.0% of their early-down passing plays generating success and a 0.37 EPA per early-down pass play mark that is second only to the Saints in the entire NFL. The Bengals are one of the worst teams in terms of early-down efficiency defensively, allowing positive EPA on early downs in both the passing game and the running game, but they have also been ok offensively themselves, generating success on over 52% of early-down passes (granted, mostly with Andy Dalton and A.J. Green). Our thought is that the Chargers should be able to get to 30-35 points in this one, and pretty quickly, with the Bengals finding just enough success against a Chargers defense that allowed 30 last Sunday night to a struggling Big Ben and the Pittsburgh Steelers. Counterpoint (GC): The Bengals are about as devoid of offensive talent as it gets, and the Chargers are coming off an impressive come-from-behind win out in the open air (hereafter named the Phil Rivers). Feeling good about themselves, the Chargies will lay an oh-so-predictable egg while the Bengals will be lucky just to make it to the stadium on time. Jeff Driskel’s passer rating from a clean pocket is 16 points lower than Rivers’ rating when pressured. Translation, Chargers 18 – Bengals Starvin’ like Marvin.